Hello everyone! It’s been a little over a month since my last article and a lot has happened in that time. We have had a new set release and a big shakeup has happened to the meta. Since TTW dropped, I have been spending a great amount of time brewing and testing the new cards. There were two decks that I had been testing which stood out that I was considering bringing to the Lemoyne ARG on Dec 26. The first deck was Dark Alice midrange. Dark Alice is my favorite ruler Force of Will has printed as of yet. She is a decent sized ruler with target attack when she flips and she provides a very relevant and powerful ability when she enters the field. Her god’s art is very strong and helps put the game firmly in your favor. I really love playing darkness in this game and I feel it is very powerful. In testing I found Dark Alice to be a good ruler for the dark control/midrange deck. It was a blast to play and have very good matchups against the slower control decks and combo decks. The deck looked very promising and I really enjoyed playing it. Unfortunately I was not able to work the numbers to make the red rush matchup as favorable as I would have liked. I expected to see a large number of aggro at the event so I was unsure of playing it there. 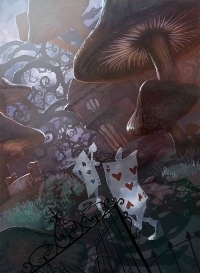 The second option was Reflect/Refrain Alice world. Ever since I began playing Magic I had always enjoyed combo decks and I thought they could be very fun to pilot. One of the most powerful things you can do in a card game is to take multiple turns in a row and doing it cheaply and consistently is even more powerful. 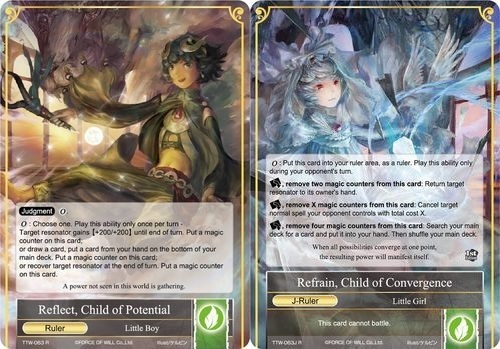 The printing of Reflect/Refrain provided a huge boost to consistency to the old Alice World Deck and in combination with Morgina was able to speed up the deck. In testing I found the deck to be very consistent; able to go off turn 3 or 4 without interruption and by turn 5 while fighting through some disruption. As I tested, I found the deck to have favorable matchups against decks like Val 2.0 and Red Rush which have less disruption and struggled against control and midrange decks like Vlad and Dark Alice, which had large amounts of hand and field disruption. The drive up to Lemoyne was smooth though rainy. When we arrived at the store I was happy to see familiar faces from other events I had attended and we discussed our thoughts on the new set before the event started. The turnout for the event was sadly not very many with only 11 people registering for the event. Being the day after Christmas, I had figured the event was not going to be very large but I was hopeful for a somewhat larger turnout. A tournament in New Jersey was being held the following day which may have also impacted attendance. Due to the small size, there were only 4 rounds and a cut to top 4. My round one opponent was one of the store employees who was playing an interesting machines deck. It focused of the one turn kill (OTK) with Imitation Dragon and March of the Machines. It played 10 different stones and Shakespeare which functioned as a Gretel for the deck. His deck was just a turn slower than mine so I was able to combo him out both games before he was able to kill me. My second round opponent was my friend and playtest partner. As we sat down to play at the feature match table (the store was streaming the feature matches) we joked about being paired against each other again. We had been paired against each other at the last ARG we went to together in October and joked about the continuing trend. I knew the matchup between us was very close and could go either way. I was on the play and his first turn was Rukh Egg into Cthugha with a pump. Turn 2 he played lance and swing with the team. Turn 3 was an Ame on lance and a Rapid Growth putting me near death. I wasn’t able to combo and was swiftly killed next turn. Game 2 he opened with a Flame Sprite and played another turn 2. This card is the bane of my existence and they can easily kill my guys. Sprites are a real pain to kill. I was able to put enough resonators on the board to keep him from killing them all with the sprites. I then cast a Sprint of the Beast Lady and hit him for 3400 for the win. Game 3 was very similar to game 2. I was trying to get enough resonators on field to Sprint and swing for lethal. The game was very close as I was at 1400 before I was able to sprint and kill him. When round 3 pairings were posted, my opponent knew what he was playing against and conceded to me. He said his deck was not able to handle Alice’s World and there was no chance of winning. My fourth round opponent was also my semifinals opponent at the Halloween ARG, and I was very excited to play against him again. I saw his play in round 3 as he was the feature match and he saw me play round 2 so we both joked about already knowing each other’s deck. The matchup was a blast to play and each of our games were very close. Game 1 I kept a hand that was able to play turn 2 Gwiber but a Rapid Decay on my Wind Sprite slowed me down significantly. I managed to cast an Alice World and then drew another one on my next turn. I was then able to chain turns together until I won. Game 2 I had a similarly fast hand but he again decayed my turn one Wind Sprite and decayed my next turn Jeanne d’ Arc. He judgemented Val turn 3 and I wasn’t able to keep up with her and was beaten. Game 3 was close and only due to an unfortunate misplay did I win. I had lethal on board and was at 2100. He forgot to activate his Laevateinn a second time before sacrificing it to Hera and he put me to 200. I then swung in for game on my turn. When the pairings were posted for top 4 I was again paired against the Val 2.0 player. We joked about the fact that we had just played each other. These were more very close games and I really enjoy playing against him. In the end I was able to combo out and managed to win games 1 and 2. Once again I was to face my friend in the finals and his aggressive red deck. We ultimately decided to split the prizes but wanted to play the match out to decide the winner of the event. Game one I kept a solid hand with a turn 2 Gwiber but my friend opened with a Flame Sprite. Turn two he played another Flame Sprite and a Rukh Egg which he then used to incarnate a Cthugha. He tutored for another Flame Sprite with the egg ability and I was not able to assemble a real board presence against 3 sprites. Game 2 he opened with a Rukh Egg into Cthugha, tutoring for another Cthugha, swung for 500, then incarnated and pumped, dealing me 1200 damage before my turn 2. This was swiftly followed by a Lancelot and an Ame which quickly steamrolled over me before I was able to amass any real board presence. I smiled as I shook his hand after he thoroughly crushed me and was happy to see him win the event. The deck was a blast to play and was extremely powerful. If not disrupted, it easily won on turn 3 or 4. After playing the event, there are several changes I would make to the deck moving forward. I would first cut down the number of Send Back I am playing. They act as Alice Worlds 5-8 but in most cases running all 4 was very unnecessary. I would probably cut 2 to allow for 2 Sprint of the Beast Lady to be main boarded as I brought them in every round. I would also change the sideboard significantly as I only ever boarded in Jeanne and Sprint. As fun as the deck was to play, there is a dark side to the deck; the deck is not fun for the opponent. When the deck goes off, there is nothing the opponent can do but watch the deck take turn after turn until it kills them. As shown with my game 3 opponent, people do not enjoy playing against this deck. It reminds me very strongly of how Eggs played in Modern. For those unfamiliar with Magic’s Modern format, Eggs was a deck that played cheap artifacts and in one turn would draw their entire deck and kill the opponent by dealing 2 damage over and over. Eggs was similarly non-interactive and won in one long drawn out turn that was unstoppable once it started going off. Wizards eventually banned the key card that allowed the deck to win consistently. I really did enjoy playing this deck but feel the deck is not fun to play against. I hope you enjoyed the deck as much as I have. I plan to keep brewing more new and exciting decks that I plan to regularly be posting on Of Dice and Pens so keep an eye out for them.